iTOK, a US-based technology advisory company that helps older adults get the most from their computers and devices, has announced the results of its Healthy Heart Survey, a survey which asked aging adults about their technology usage in regards to monitoring heart health. The results come right in time to celebrate American Heart Month, an annual reminder of the importance of heart health. 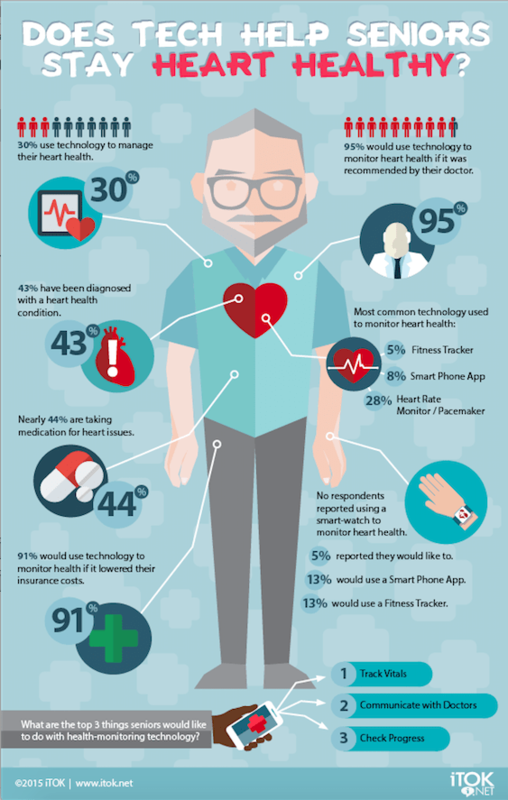 30% currently use technology to monitor their heart health. 95% would use technology to manage heart health if recommend by doctors. 91% would use technology to manage heart health if it lowered insurance costs. Most common technology currently used is a heart rate monitor / Pacemaker (28%). More information about the survey can be found at iTOK’s blog: http://itok.net/itok-infographic-using-technology-stay-heart-healthy. I think the common misconception about seniors and technology comes from a generation past – who remain skeptical of technology like cell phones. Baby boomers on the other hand, were often still in their prime as computers emerged the dominant life form on the planet – and their problem isn’t so much fear of it, as failing to understand how it works. “I’ve got this phone and it’s supposed to track my heart rate – but I can’t figure out how to work the app.” for example. I can’t blame them for this. I was the tech genius everyone in my life came to, as a teenager – but now in my 30’s, i have my own problems getting around in the digital world. As technology has evolved away from the core principles of what makes it work and settled into the core principles of what users expect intuitively… it’s left tech savvy types like me far behind. To say nothing of my parents – who almost seem to understand it better than I do, but often share the same frustrations.